Delta Force & the Stars! Delta Force Paintball have been the company of choice for a wide range of celebrities since opening in the UK way back in the ’80′s. Many of those frequently in the public spotlight visit and enjoy the products and services of the world’s leading paintball company. Our celebrities have included many sporting teams such as football and cricket, high profile actors, musicians, politicians and even gorgeous supermodels like the lovely Elle MacPherson. It’s a tough life! Our game zones themselves have been celebrities in their own right, featuring as the backdrop for various TV shows and movies over the years. With the best equipment available and movie-set props taking pride of place throughout our centres, we are the leading centre of choice when it comes to paintballing.since opening in the UK way back in the ’80’s. Many of those firmly in the public spotlight visit and enjoy the products and services of the world’s leading paintball company include many sporting teams such as football and cricket, high profile actors, musicians, politicians and even gorgeous supermodels like the lovely Elle MacPherson. It’s a tough life! 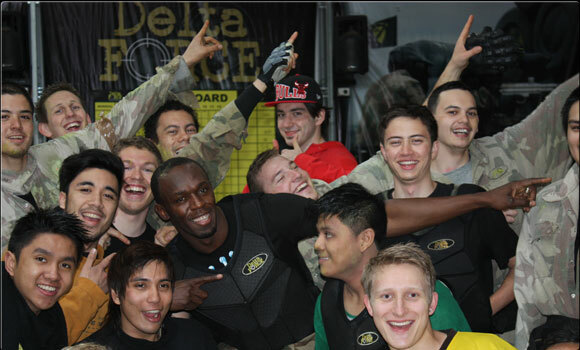 From the world’s fastest man, Usain Bolt (pictured) to top Rugby League and Union teams, to iconic worldwide sporting teams such as Chelsea FC, Manchester United and McLaren-Mercedes F1 Racing Team visiting our UK centres, it’s safe to say that you’ll have an experience to remember on a day out at Delta Force Paintball. Whether you’re a celebrity, an average Joe or a weekend warrior, come and experience the best paintball fields Perth has to offer. Come and visit Delta Force Paintball Perth in Baldivis (our Bonneys centre) or our Muchea centre where we treat all our guests as celebrities.